It has buckets of character and we'd favour it for more traditional picked, arpeggiated accompaniments. Well-made and full of character. At the top of Norman's line is the Studio range, tipping the scales at just over a grand. 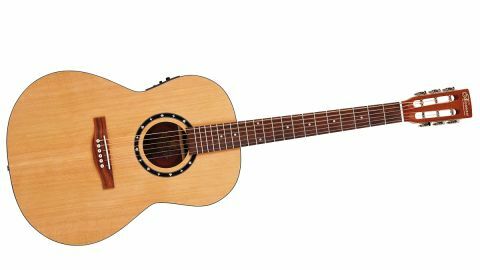 It's a slightly trimmer collection, with just six models offered - five dreadnoughts, including two cutaways, and this lone folk-size, which is also the one to come with a slotted headstock and no pickguard. Based on classical guitar proportions, as you'd expect, it feels the smallest of our trio and is instantly at home as an in-front-of-the-TV picker. Construction-wise the Studios are built from all-solid woods, so here we have a beautifully dark cedar top, with low contrast black binding and solid mahogany back and sides (with internal side supports) with a rich striped hue. It's a lovely looking combination, and the lack of scratchplate gives the top wood more space to shine and lets that maple leaf rosette breathe, while also giving it a more classical vibe. The neck has a little more shoulder to it than the others in the Norman line, especially the dread', but it's nothing that bothers its playability. Most noticeably it has more of a mid-focus: the bass a little light, especially fingerpicked, with a pretty smooth high end. It might seem more of a fingerstyle guitar, but strummed there's a nice bark to the voice that almost veers into acoustic archtop- like tonality. That mid-push, however, proves ideal if you want to be heard in a band setting especially on your lead lines or higher position arpeggios. Again there's a nice replication of the guitar's acoustic voice when you plug the ST40 Folk in. This is the one that we use for some more unusual open tunings; it really seems to suit being picked - with pick, fingers or both.